I’m a writer, editor, and teacher, and I enjoy connecting with readers and other writers. I grew up in Arkansas and am a long-time resident of Alabama, and in November 2017 I was commissioned Alabama Poet Laureate, for a four-year term. My latest book is a poetry chapbook, "Borrowed Light," and my current writing project is a biography of the writer Sara Mayfield. I call this blog "A Map of the World" because I think that, as writers, we each map our own lives, imaginations, and world. Welcome to my particular map! Below you'll find occasional blog posts, as the spirit moves me. 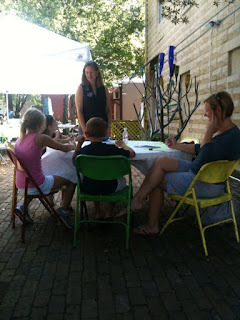 Here are a couple of pictures from my September 18th reading and writing workshop at the Kentuck Arts Center. There were glimmering bottle trees made by Steve Davis all over the courtyard. Thanks to the workshop participants, kids and grownups, for being there! Southern Writers on Writing, Susan Cushman, ed. ; A Second Blooming, Susan Cushman, ed., The Shoe Burnin': Stories of Southern Soul, Joe Formichella, ed. ; Even the Daybreak, Jessie Lendennie, ed. ; MOTIF 3: Work, Marianne Worthington, ed. : MOTIF: Writing by Ear, Marianne Worthington, ed. ; Whatever Remembers Us: An Anthology of Alabama Poetry, Sue Walker and J. William Chambers, eds. ; multiple Limestone Dust Poetry anthologies, Allen Berry, ed. April 13: Alabama Book Festival, Southern Writers on Writing panel and poetry panel moderator. March 16, Borrowed Light launch, Madison (AL) Public Library, 2-4 p.m.
March 18, Borrowed Light reading, University of Montevallo, 3:30 p.m., J. A. Brown Room, Carmichael Library. March 27, Borrowed Light reading, University of Alabama at Huntsville, Wilson Gallery, 2-4 p.m.
April 2, University of Alabama Creative Writing Masterclass, 9:30-10:30 a.m., Morgan Hall 301. April 13, Southern Writers on Writing panel, Alabama Book Festival, Montgomery, AL. March 24-25, Panelist, Tennessee Williams/New Orleans Literary Festival. September 28-29, Master Class, Chattahoochee Valley Writers Conference, Columbus, GA.